The next window, executed by D’Ascenzo, honors Samuel and Elizabeth Hoyt. The window was given by William R Hoyt, the “Willie” who wrote the letter quoted earlier, dated April 26, 1914, which told Dr. Lyons of the action of the Session to issue a call to him to come to Atlanta. The small scene at the bottom is very interesting. Before Christ ascended to heaven, he told his disciples to remain in Jerusalem until they received the Holy Spirit. Here they are on their knees praying for the Holy Spirit to come. As the disciples waited in the upper room, 40 days later, there was a great rustling like a strong wind. Acts 2:2-3 - And suddenly there came a sound from heaven as of a rushing mighty wind, and it filled all the house where they were sitting. And there appeared unto them cloven tongues like as of fire, and it sat upon each of them. 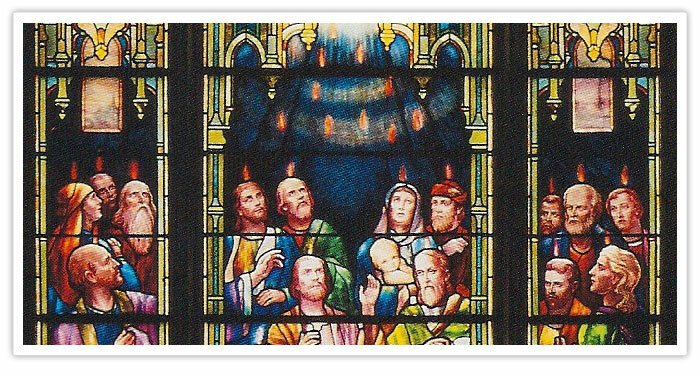 The great scene shows the Holy Spirit coming into their lives, just as the Holy Spirit enters into the life of every believer in every generation. Above is a dove. In the New Testament the Holy Spirit is frequently represented by the dove.